On Monday (20 February 2017), I was delighted to show my support for a mass lobby of Parliament organised by the3million.org.uk, UNISON and New Europeans in support of EU citizens’ right to stay in the country after Brexit. 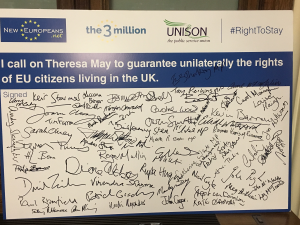 I was proud to sign a pledge to call on Theresa May to guarantee unilaterally the rights of EU citizens living in Scotland and the UK, as the SNP-led Scottish Government has called on them to do following the result of the EU referendum. MPs from six different parties signed this pledge, representing the widespread concern of parliamentarians on this issue. Around 180,000 EU nationals are currently resident in Scotland and make a highly important contribution to Scottish society. I believe workers from across Europe play a vital role in our public services, especially in the NHS where in Scotland 5% of the overall NHS workforce are EU nationals. Many of these people are long existing residents of Scotland and the UK, they and their families deserve better than years of uncertainty and being reduced to bargaining chips in the upcoming negotiations. The Government must reconsider their stance on this important issue and unilaterally grants the Right to Remain for EU citizens before the process of Brexit negotiations begins.